When Adar Poonawalla, CEO of Serum Institute of India, launched a clean city initiative a year ago, it was done so with a promise to change the face of Pune. “The recent cleanliness rankings by the Swachh Sarvekshan show that we have helped the civic body ensure that it is among the cleanest cities,” Poonawalla told The Indian Express. With the active involvement of the Pune Municipal Corporation and local residents, the initiative has been able to keep approximately 40 percent of the city clean, said Poonawalla. In the backdrop of the burgeoning crisis in the disposal of waste, Poonawalla said they were keen on setting up a state-of-the-art waste to electricity plant to address the problem permanently. “We have submitted our proposal and have asked PMC to give us land for this purpose,” he said. 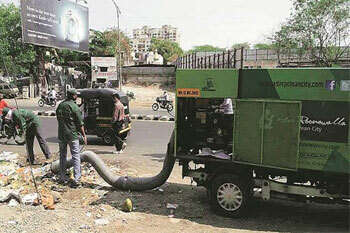 The Adar Poonawalla Clean City Initiative is the first time a private company – the Serum Institute of India — has invested Rs 100 crore to help the civic body rid the city of garbage. “….Daily, 50-70 tonnes of garbage is cleared,” said Krishnan Komandur, CEO of the Adar Poonawalla Clean city movement. “This is done with a team of 300 employees and NGOs working diligently to keep our city clean,” said Poonawalla. The initiative is mapped with the help of an app (myapcc), specifically designed to report a garbage issue and resolve it. The app is available on Google Play Store and Apple Play Store, so that local residents can download it and participate in the initiative. “…We want to make Pune more livable and the initiative is focused on creating awareness among students about the importance of segregation and other issues,” said Poonawalla.